Very simple and very entertaining. 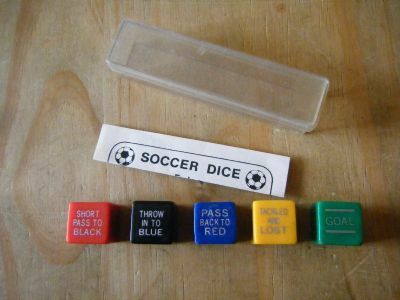 Roll a coloured dice and obey the command - you may then roll another dice to see what happens, you may be tackled, pass or eventually score a goal. Simple fun. Five coloured dice, rules and a case. Simple. Start with the red dice and see what happens from there.